This was the beginning of an adventure for myself and my fellow travellers. As my new friends marveled at the soft white sand between their toes and prepared their snorkel gear I did what I always do when I find new horizons to explore. I wandered off with my camera in hand. After all, I was the ships naturalist and had a duty to find, report and record any wildlife that may be present. I smiled to myself as I headed inland. My mind raced back to twelve months previous when I had been offered this unique chance to lead a tour to Indonesia for a small, but well established Cruise Company operating two sailing ships out of Bali. At first I had to pinch myself. After all its not every day one gets the opportunity to do what they love and actually get paid to do it. I had signed up with excitement and now found myself standing on a desert island, camera in hand, looking for spiders (amongst other things). The air was warm but a cool breeze blew in form the South side of the island. The island is not a big one with a perimeter that could be probably walked in around an hour. To the North shore is a beach of ivory white sand whilst to the South is a line of trees that cling to life precariously and protect the open grassland that lies to the center of the island from the strong winds that blow in from the sea. 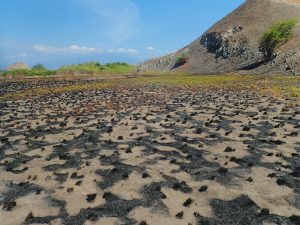 At the time of our visit the whole area had been suffering from extreme drought and the scrubland had at some time fallen victim to fires although the charred grass was now showing signs of recovery. As a naturalist I have a mantra given to me by an old friend now long passed. It simply says “Hope to see everything but expect to see nothing”. It has stood me well when faced with such landscapes. It pays to realize that if you want to see something you must be patient. It was obvious that large animals did not exist in this landscape, I further accepted that the birds overhead were more than likely to be fleeting visitors from the mainland. No, if I wanted to find something of interest it would have to be small. Of course as an entomologist and arachnologist that would suit me just fine. I began to poke around in the tufts of grass. I soon came across a few elaborate spider webs centered around the grass tufts. They were obviously those of some kind of funnel web spider but any attempt to tease their reluctant occupants out proved in vain. I then turned my attention to the trees on the shoreline. I came across a web and there in the center sat a small but nevertheless beautiful spider. It was a Gasteracantha species also known as thorn spiders. Such spiders have evolved to be unpalatable to birds that swallow them. The birds soon spit them out allowing the spider to continue on its way. 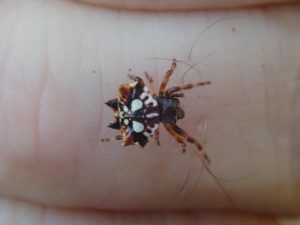 It was a species that I recognized as Gastercantha mammosa also known as the Asian Spiny Spider or Double Spotted Spiny Spider. Whatever its name it was surely beautiful. I soon found more of this beauty all with webs that blew in the wind with their occupants precariously hanging from the center. Content with my find and to be honest feeling rather smug I continued with my search. If there were one species, there would be others. Delving into the tree line I continued my quest with renewed vigour. As I looked closer I came across a big web. A very big web. Probably some 400mm in diameter and there in the middle sat a huge spider. She was magnificent. I estimated her leg span to be around 100mm. the web was littered with the remains of wind borne prey. Radiating out from her central position were two thicker white silk strands produced by the spider from her cribellum. This is a small plate structure covered with thousands of tiny spigots, holes so small that hardly project from the surface, in contrast to the elongated spigots that project from spinnerets. These minute spigots produce extremely fine fibres, merely tens of nanometres thick, which are combed out by the spider’s calamistrum, producing silk with a woolly texture. They are designed to give the impression that the spider is bigger than it actually is and by doing so deter predators such as birds. It also works by confusing any would be predator as to the best point of attack. Any bird watcher will tell you that a bird normally has one chance to carry out its deadly assault. Miss and the prey escapes. In this case any unsuccessful attack would result in the spider falling to the floor and making goods its escape. It is hard to describe the feeling when one comes across something like this. It’s a eureka moment. An epiphany. I looked closer this was new to me. My excitement grew. I knew it was an Argiope species but which one if indeed this had been seen before. The closest I had seen previously was Argiope appensa otherwise known as the Hawaiian garden spider but this was slightly different. 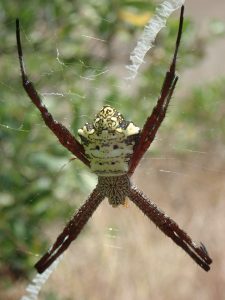 This type of Argiope is found from Sumatra, throughout Indonesia, Papua and into the Pacific to Hawaii. This was intriguing. The body shape was similar but the abdominal pattern different. 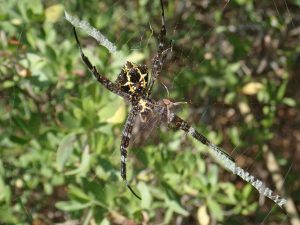 The legs on Argiope appensa are striped but those on this spider were uniform. I crept ever closer my camera in hand. I reeled off a few shots. I could hardly breath I did not want to disturb my quarry. Another shot and then I retreated to examine my prize. On closer examination I realized that not only had I captured this potential new species on film but there sitting calmly in front of the large female sat the much smaller male. This was indeed a coo. It may not be a new species to science but it was to me! 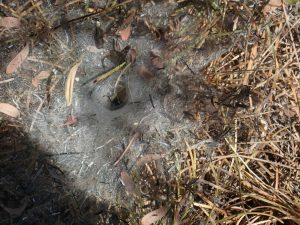 The chances are that it is Argiope appensa but this particular sub species was unique to this island. Finding new species is difficult anywhere but actually describing them to science is a daunting task and male and female specimens are required. But I had no intention of disturbing these beautiful creatures. My weapon is my camera. I proudly rejoined the group and like a schoolboy with his first straight A report card I shared my luck with them. Content that I had fulfilled my first task I too slipped on my snorkel gear and slipped beneath the waves to the coral reef that lay beneath this idyllic sea. Back on ship I tentatively called the find Argiope appensa. 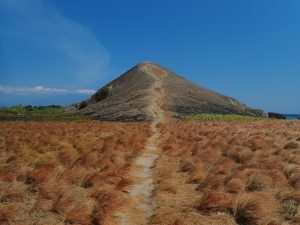 “Kenawa Island”…..I will return one day and marvel again at this wonder of nature.